While we eagerly await the many delightful firsts of the season — peas, asparagus, and strawberries, just to name a few — we’re making our way through our remaining stores. We excavated the last chicken from the freezer and set on pot-roasting it, a technique befitting the mantra for cooking pasture-raised and locally-sourced meat: long and slow does the job. We served up the juicy results with a side of spring-sweet spinach, simply sautéed with garlic, and baby carrots simmered with a pat of butter until thoroughly glazed — a simple yet satisfying supper, with enough leftovers for several more meals the rest of the week. 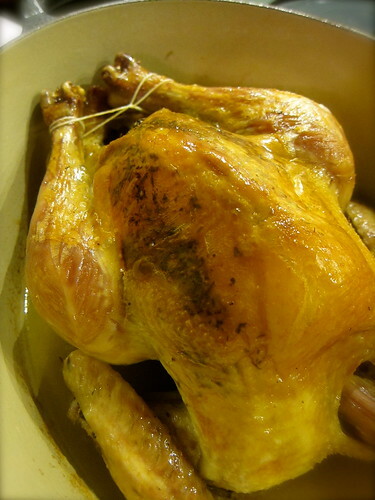 – Pat the chicken dry, massage some olive oil into the skin, and season with salt and pepper. Truss the legs for more even cooking, and place chicken in a Dutch oven or clay pot. Add about a ½ cup of liquid — white wine, stock or water will do — enough to coat the bottom of the pot. Cover the pot and place in a 275°F oven. Let cook for 2½ to 3 hours, depending on the size of the bird. When ready, the meat will have begun to pull away from the end of the drumsticks, and the whole leg should feel lose in the joints. 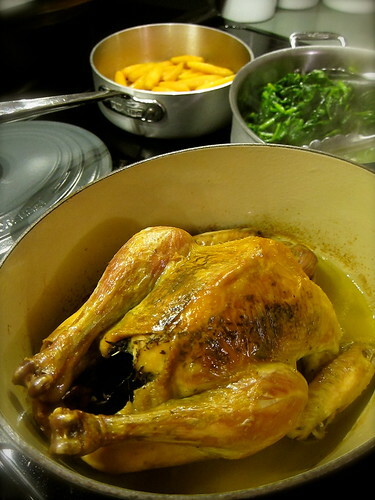 – To brown, remove the pot cover and baste the chicken with additional olive oil. Turn up the oven to 400°F and cook for another 30 minutes, or until done to your liking. Remove the chicken from the pot, and let rest 10 minutes before carving. As it’s being carved, we like to let the pieces rest in the pot juices to soak up additional moisture. Serve with more of the juices or a gravy alongside. – For crispier skin, gently lift and separate the skin from the breast and legs, and let the chicken air dry in the fridge, loosely covered, overnight before cooking. While we were at it, we tucked in a mix of sage, rosemary and thyme under the skin for additional flavor. Local ingredients: Chicken from New Roots Farm; spinach from Heron Pond Farm; carrots from Meadow’s Mirth; garlic and herbs from the garden. This entry was posted in cooking and tagged carrots, poultry, spinach. Bookmark the permalink. looks succulent. the simple things are the best things. Especially when the ingredients are so good! Although I regularly roast chicken I’ve never pot roasted it. I really must invest in a decent pot as that looks lovely. I imagine with your more temperate weather, there’s not as much need to have a Dutch oven! It’s a Le Creuset enameled cast iron pot; the enameling keeps food from reacting with the cast iron.